The chapel was established in the middle of the 18th century and consecrated to St. Anne and 14 helpers. Its construction and making of the three part alterpiece was reinitiated by Vrchlabi's citizen Antonin Schulz. 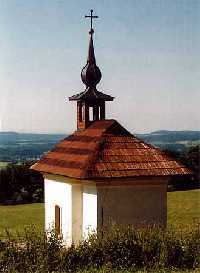 The chapel is located at a place that offers the most beautiful view over Vrchlabi and also guardianship in reality and implicitly by the instrumentality of spiritual force and beliefes. The chapel withstood action of time but in the 60s of the last century it burnt down. Only some rest of the peripheral walls were left. 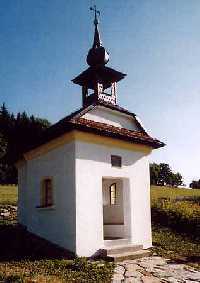 The chapel was renewed thanks to a public collection in 1997-2000. Original alterpiece from 1754 (preserved in Krkonose Mts. Museum) pictures the Wholy Family – Virgin Mary with baby Jesus and St. Anne, the patron of the town Vrchlabi, and 14 holy helpers who reinforce the guarding power of St. Anne. Located over the entrance of the chapel is a marker with a German inscription to commemorate the visit of the Emperor Joseph II. in 1778. A wooden sculpture of pilgrim Francis, made by woodcarver Petr Kysela in 2002, is situated in front of the alter.